ilovefuzz.com • View topic - General Question. What OTHER fuzz pedals do I need …? General Question. What OTHER fuzz pedals do I need …? So I ventured into the world of fuzz pedals last week. It was between the BE Twosome and BAT Coven. The Coven won this go round, but I have been listening to a lot of demos of the Crystal Dagger, Musket, Blunderbus and so forth. Wondering what would be a god compliment to what I have coming in the mail today. Seems like fuzz, in and of itself is a black hole of wonderfully unique and guilty pleasure spending! Many forum friends have warned me it gets addictive. Re: General Question. What OTHER fuzz pedals do I need …? If you don't have a specific sound in mind; look for clearance deals. I look for that crazy, crazy pricing that I can buy a pedal, try it out for some time and if I don't like it I can probably sell it for the same thing because at this point I have too many pedals. I think any of the Blackout pedal you mentioned would be great. The Crystal Dagger is pretty unique sounding. 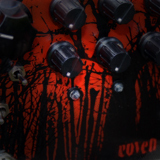 You've got your Muff needs covered in the Coven, but the Blunderbuss is a great pedal too. Two very different sounding Muff variants there. The Fix'd Fuzz Deluxe is a veritable Swiss Army knife of fuzz. So, as echoraven mentioned, it all really depends on the sounds you're looking to hear. echoraven wrote: If you don't have a specific sound in mind; look for clearance deals. I look for that crazy, crazy pricing that I can buy a pedal, try it out for some time and if I don't like it I can probably sell it for the same thing because at this point I have too many pedals. Any place in particular worth checking out? I am not ashamed to admit I am a metal guy at heart. Priest, Maiden, Accept, etc. but I also listen to a good bit of Stoney/Doom type stuff. As of late though, I am really digging Jack White's guitar sounds. I had need paid much attention to his work but he gets some killer sounds. I need to learn a little more about types of fuzzes I suppose to know what I am looking for. I still don't know the difference between silicon or germanium (? ), is it Muff based, etc. I know for sure I like some of the HM2 variants I have heard in much heavier stuff like Entombed, Tragedy, Disfear. Check out the Foxx Tone Machine and Industrialectric Square Wave Generator. Chankgeez wrote: I think any of the Blackout pedal you mentioned would be great. Chank is steering you in the right direction...your Pharaoh side will cover muff tones all day long, and you've got great lower gain tones in the Black Forest side. If you want different, I might suggest looking for a FuzzFace variant...something like an EQD Dirt Transmitter or Dream Crusher. The DT would allow you to get less-than-smooth velcro tones, big contrast to the sustain you're getting from the Pharaoh. The Blunderbuss would be a nice compromise, huge muff sound with mids! I just got a Fix'd Deluxe recently and have been blown away by the quality of tones and it's versatility. All the options DO make it tough to decide...ILF helps inform you but makes it tough to resist...good problems to have!